We have become so blasé that babies now use mobile phones as teething toys. 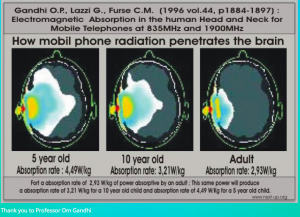 And yet, holding a phone to your head is like holding a low-powered microwave oven close to your brain, according to Dr. Ann Louise Gittleman – author of Zapped: Why Your Cell Phone Shouldn’t Be Your Alarm Clock and 1,268 Ways to Outsmart the Hazards of Electromagnetic Pollution. I tend to fall upon my mobile phone like a ravenous beast as soon as my son is asleep; just a few hours unattended has me desperate for a social media swipe and WhatsApp check. But when I’m with Ajax, I’m pretty good at leaving my phone alone – this photo is the only time my son has held a mobile. Despite this lure of another ‘quick look’, the research on mobile phones and babies is more compelling. Brain tumours have overtaken leukaemia as the leading cause of cancer death in children (both linked to electromagnetic exposure). Never before has a generation been surrounded by electromagnetic radiation (EMR). Never before has a generation of newborns slept with monitors next to their heads emitting these harmful rays. Never before has a generation learnt how to ‘swipe’ before they wipe or listen to nursery rhymes streamed from Spotify. We assume that because everyone is doing it, it’s OK. But the research tells another story. Mobile phone use raises children’s risk of brain cancer five-fold, according to a 2008 study from the University Hospital in Orebro, Sweden. The lead author, professor Lennart Hardell believes that children under 12 should not use mobiles except in emergencies and that teenagers should use hands-free devices or headsets and concentrate on texting. In 2015, France banned the use of WiFi in nursery schools. In Russia, scientists have advised that anyone under the age of 18 should not use a cell phone… the UK seems to be slow to follow suit. One British doctor, Erica Mallery-Blythe, is hoping to change that with her grassroots organisation PHIRE (Physicians Health Initiative for Radiation and Environment). The website is replete with short videos, easy-to-understand diagrams and a wealth of studies to convince any parent to cut their kids exposure. Children have a longer time ahead for latent effects to manifest. Despite the dangers of mobile phones and babies, I’m not deleting my Ocado app or living without Uber just yet. So what’s the middle ground? Unless you choose to go ‘off grid’ and live in a converted caravan, most of us will need to focus on minimising mobile/WiFi use rather than removing it entirely. Thankfully there are some simple changes you can make that will dramatically cut your exposure. * Keep your mobile as far away from you and your baby as possible. The iPhone 4 Important Product Information Guide states that you should keep your phone at least 15mm away from your body at all times, otherwise the legal guidelines for mobile radiation will be exceeded. * Download your e-mail and then disconnect from WiFi, allowing you to read and respond without being exposed. * Avoid using your phone while you are on the move. 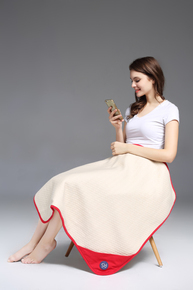 * Cover your baby with a radiation shielding blanket from Radiasmart.com.au when travelling (to avoid cosmic radiation) or to protect yourself when working on a laptop. * If you work from home, install an Ethernet cable to your main computer so you can switch the WiFi off (as I have done). * Say no to smart meters from your utility companies. Smart meters can expose the body to 160x to 800x times as much microwave radiation as mobile phones. * Only use your phone where the reception is good. The weaker the signal, the more power your phone must use to transmit – leading to more radiation.